I have a button with two isolated tracks. I want to be able to wake up esp from deepSleep with this button, and also detect that it was clicked. So i can't connect it to reset, because esp won't work if i don't release a button. And if it's not at deepSleep, it will reset, and i don't want it. How to do this? 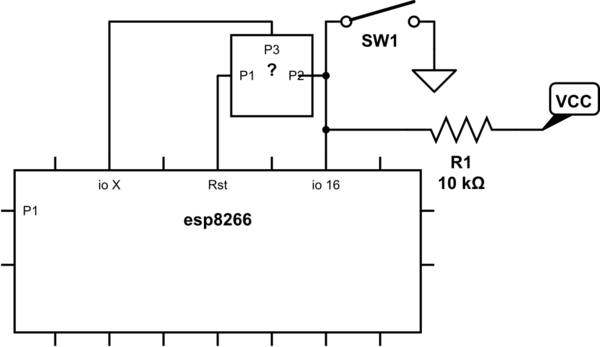 Use some other pin to hold RESET HIGH or to disconnect the button from RESET while the esp8266 is not running. I asked on EE SE for the missing part of the circuit. When you push, RST has GND so the ESP gets reseted. EDIT Thanks Juraj for the comment: "from SDK API "system_deep_sleep(0): there is no wakeup timer; in order to wake up, connect a GPIO to pin RST; the chip will wake up by a falling-edge on pin RST." Not the answer you're looking for? Browse other questions tagged esp8266 power sleep or ask your own question.